January 2016 – "Expertise, Right Across the Board"
In conformal coating, capillary flow is where the coating pulls or runs away from areas of a PCB thus leaving a patchy finish. Aside from traditional liquid coatings, Parylene and fluorochemical materials serve as potential coating alternatives. Parylene is used in a dry process wherein the coating is deposited in a gas vacuum chamber. On the other hand, fluoropolymer surface modifiers are ultra thin coatings that are applied at a few microns in thickness. Cleaning circuit boards prior to conformal coating can help prevent contamination and improve the coating process. It also ensures the long-term reliability of the board. Various types of contaminants are eliminated when the boards are cleaned. These include manufacturing and assembly residues. The key is to match the circuit board with the cleaning process and the materials. Corrosion is the chemical or electrochemical reaction that happens between the circuit board and its environment. This results in the deterioration of the board and its properties. What are the important physical properties of a conformal coating in production? Conformal coating is composed of different physical properties. One of which is liquid. The liquid properties need to be defined prior to the conformal coating. The properties include flash point, storage lifetime, appearance and colour, density, solids content, and viscosity. Author nexus3cPosted on January 20, 2016 January 21, 2016 Categories MaterialsLeave a comment on What are the important physical properties of a conformal coating in production? Selective spraying is one of the most efficient conformal coating techniques. It involves the use of a robotic program that accurately targets circuit board areas that needs to be coated. It also avoids the components that don’t need coating. A wide range of specialist spray guns are used to achieve this kind of efficiency and selectivity. It creates a precise spray pattern during the conformal coating process. Selective spraying can be used for all conformal coatings. A specialized robotic machine is required for the application of selective coating. The initial investment is high but the ROI is good as it can handle high volume of coating. Operating the robotic system requires extensive skill and training. It eliminates the need for masking since the spraying is targeted. It is a medium to high volume process. There are advantages and disadvantages to using selective spraying. Some of the benefits include the elimination of masking, high speed coating, and high volume processing. The downside of this technique is that it requires huge capital cost and high level of skill and expertise to operate. 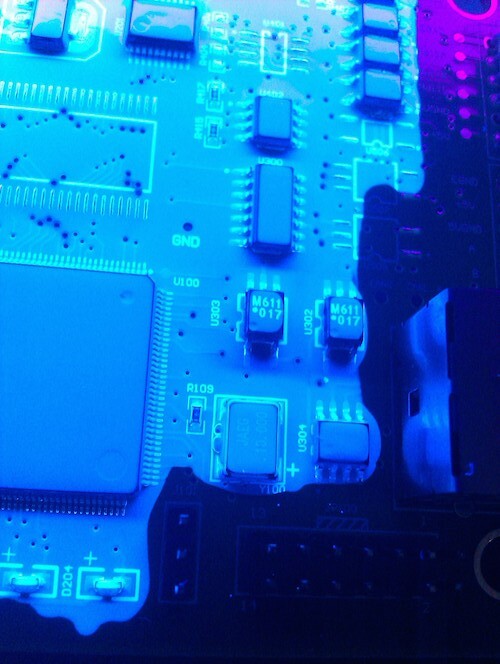 Vapour Deposition is a unique conformal coating technique as it is a dry process unlike other methods that are liquid-based. The coating is applied on circuit boards through a vacuum chamber where the components are coated in batches. Parylene is a material applied during the deposition process at room temperature. All parts that shouldn’t be coated ought to be masked prior to the vapour deposition. It requires a specialist system that is designed for vacuum application. Coating thickness is an important parameter and calculations should be exact. It is one of the most expensive coating processes but produces the best finish. Just like other conformal coating application process, there are advantages and disadvantages to using vapour deposition. Some of the benefits include excellent protection due to very low permeability, high solvent and salt protection, and 100% clarity as Parylene can coat optical components. On the flipside, the capital costs are high, preparation can be challenging, and it requires the highest masking level.